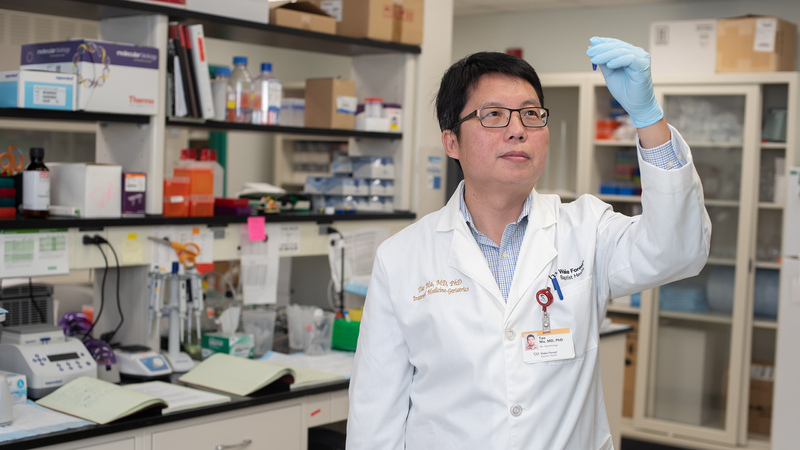 Tao Ma, MD, PhD, researches the molecular signaling mechanisms underlying Alzheimer’s disease and Down syndrome in an effort to identify candidate therapeutic targets and biomarkers. Ma and his group are working with transgenic mouse models of Alzheimer’s disease and have identified a defect in protein synthesis that may generate cognitive deficits and dementia in patients. Ma notes that industry can aid translation of this significant finding by helping to develop a small molecule drug to address the target, with a potentially profound impact on this severe and growing public health crisis. Ma received his medical degree in China in 1996 and completed his PhD in neuroscience at the Mount Sinai School of Medicine in 2008. He pursued postdoctoral work at Weill Cornell Medical College in New York and in 2010, he became an assistant research scientist and then research assistant professor at the Center for Neural Science at New York University. In 2014, he joined Wake Forest School of Medicine as a tenure track assistant professor. In his laboratory, Ma and his team focus on developing new understanding of the molecular signaling mechanisms underlying Alzheimer’s disease and Down syndrome. They hope to find new therapeutic targets and diagnostic biomarkers for Alzheimer’s disease. Currently, there are no effective treatments, so Ma is working to define the very basic mechanisms contributing to the pathophysiology of the Alzheimer’s disease, which is growing rapidly in prevalence and emerging as a major public health crisis in the United States. Ma employs several state-of-the-art methods in his research, including innovative approaches in pathology, cell biology, synaptic electrophysiology, confocal imaging, mouse genetics and behavioral tests. In human studies and a transgenic mouse model, he has shown that a certain protein synthesis defect (hyperphosphorylation of a molecule called eEF2) appears to contribute to Alzheimer’s disease-associated dementia and loss of synaptic plasticity. He believes that developing knowledge about the basic mechanisms contributing to the pathophysiology of Alzheimer’s disease will lead to desperately needed new and novel therapeutic strategies and diagnostic biomarkers. Ma would like to collaborate with industry partners who understand Alzheimer’s disease and understand the importance of his lab’s research in an effort to develop new therapeutic strategies. He offers considerable expertise with signaling pathways and molecular mechanisms associated with Alzheimer’s disease and envisions teaming with industry partners who will be anxious to explore new frontiers. Ma sees industry collaboration as the best method to translate his research to clinical applications, with the ideal partner adding their complementary expertise and advanced technologies such as high-throughput screening to help produce new candidate compounds. Timothy Hughes develops biomarkers and discovers risk factors in vascular and metabolic systems that may compound or accelerate the process of dementia.